Trusted Traveler Programs: Are They Right for You? No matter how much you love to travel, some parts of the process are inevitably a hassle. No one enjoys long lines to clear immigration, or the awkward strip tease to take off jackets, shoes, and belts at TSA security. If you’ve ever wished there was a way to breeze through immigration and security lines, one of the Department of Homeland Security’s Trusted Traveler programs might be perfect for you. The four Trusted Traveler programs are all based on a common system called the “Known Traveler Number.” When you apply for one of the four programs, the Department of Homeland Security will run a background check to ensure that you are a low-risk traveler. You are then issued a Known Traveler Number that you must enter when booking air tickets or other travel arrangements. You may also be issued a card or passport sticker, depending on which program you choose. Your Known Traveler Number, as well as your membership in the Trusted Traveler program, will be good for 5 years, after which you will need to re-enroll. All of the programs require you to pre-enroll online, and then visit an enrollment center for a brief interview to have your ID checked and your fingerprints taken. The TSA Precheck program is open to US citizens and permanent residents (“green card” holders). Members of the program are able to use expedited security screening lanes at participating US airports. Even better, if you are a member of TSA Precheck, you don’t need to take off your belt, shoes, or light jacket, and your toiletry bag, laptop, and other electronics can stay in your carry-on bag. If you are traveling with children under age 12, they also can go through the expedited TSA screening with you. 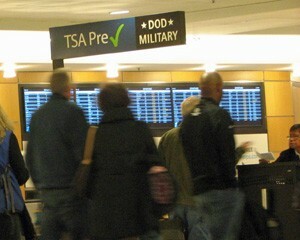 The TSA Precheck program is perfect for anyone who flies frequently, either to domestic or international destinations. A 5 year membership costs $85. Members of the program are not issued a card, but instead the Precheck logo will be printed on your boarding pass whenever you fly out of a participating airport. Members of the other three Trusted Traveler programs are automatically enrolled in TSA Precheck at no additional charge – all you have to do is enter your Known Traveler Number when booking your tickets, and the TSA Precheck logo will print on your boarding pass whenever you use an airport that has Precheck lanes. Global Entry, as the name suggests, is the Trusted Traveler program for people who travel internationally on a regular basis. The program is open to any US citizen or lawful permanent resident who holds a valid passport. Citizens of Germany, Netherlands, Panama, Mexico and South Korea are also eligible for Global Entry. In addition to the TSA Precheck benefits, Global Entry allows you to go through expedited Customs and Border Patrol lanes at the airport to clear immigration and customs whenever you return to the United States. A five year membership in Global Entry costs $100. When you’re approved, you’ll be issued a sticker for your passport, but since your membership is linked to your passport number, the sticker is not required to utilize the benefits of Global Entry. If you have to renew your passport during your 5 year membership, you can simply log in to your Global Entry account online and register your new passport number at no charge. The Department of Homeland Security’s NEXUS program is designed for travelers who travel frequently between the United States and Canada. It is open to citizens and permanent residents of both Canada and the US. NEXUS program members are able to use expedited immigration lanes when transiting between the US and Canada at land borders and airports. It costs $50 for a 5 year membership in NEXUS. NEXUS members are issued a card that can be used in lieu of a passport book or passport card when crossing land borders between the US and Canada. If you are flying to Canada, you would need to carry both your passport book and NEXUS card. NEXUS membership includes TSA Precheck and Global Entry privileges, and can be used by Canadian citizens who would like to take advantage of those programs. SENTRI stands for “Secure Electronic Network for Travelers Rapid Inspection.” It is primarily aimed at people who frequently cross the US/Mexican border by car or truck. In addition to getting a Known Traveler Number, SENTRI members also register their vehicle’s license plate number, which allows them to drive through the expedited SENTRI immigration lanes at the border. SENTRI members may also drive through the NEXUS lanes when crossing the Canadian border. SENTRI membership costs $122.25 for five years, and is open to US citizens, permanent residents, and anyone who is legally admissible to the US (citizens of Visa Waiver countries and anyone with a valid US visa.) Members are issued a card with a RFID chip that also allows them to access TSA Precheck and Global Entry benefits.